Strategic Planning for Information Systems explores the impact that information systems (IS) and information technology (IT) have on business performance and the contribution that they make to the strategic options of organisations. It describes tools, techniques and management frameworks to both align strategies for IS and IT with business strategy, as well as seek out new opportunities through innovative deployment of technology. 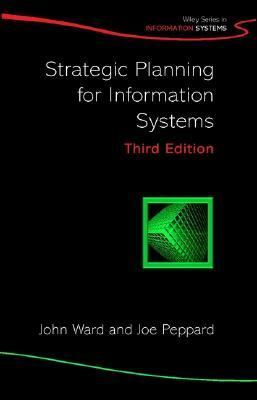 This book demonstrates why strategic planning for information systems is essential to organisational success, especially in times of increasingly rapid change. Over the long term any organisation will get the information systems it deserves, according to the approach adopted to the use and management of IS/IT. To obtain the whole range of benefits available from IS/IT and avoid the potential pitfalls, every organisation must establish the means to manage IS/IT as an integral part of its approach to strategic management. In the six years since the second edition of Strategic Planning for Information Systems, much has changed in the way business is organised and in the importance of IS for competitive strategies. However, the essence of the book remains the same - it is a practical and comprehensive book written in a clear and straightforward way. The new edition introduces more approaches and techniques to aid in developing and implementing strategies - to enable management and IS/IT professionals to identify what needs to be done and how best to do it.Ward, John is the author of 'Strategic Planning for Information Systems', published 2002 under ISBN 9780470841471 and ISBN 0470841478.